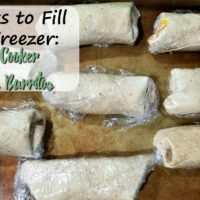 I love freezer meals where I can just dump everything in a bag and put it straight in the freezer. 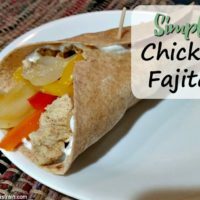 These Slow Cooker Chicken Fajitas fit that description perfectly! I didn’t even have to thaw or cook the chicken first; I just put the frozen chicken straight into the bag. I’ve made these before and they’re an easy healthy dinner to make in a hurry. 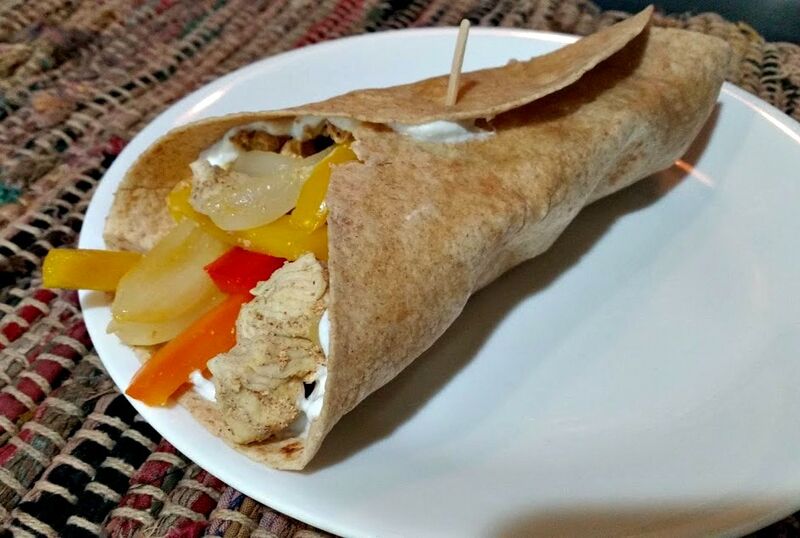 You’ve got your chicken and vegetables; and adding a tortilla and a side of rice would make it a well-rounded dinner! 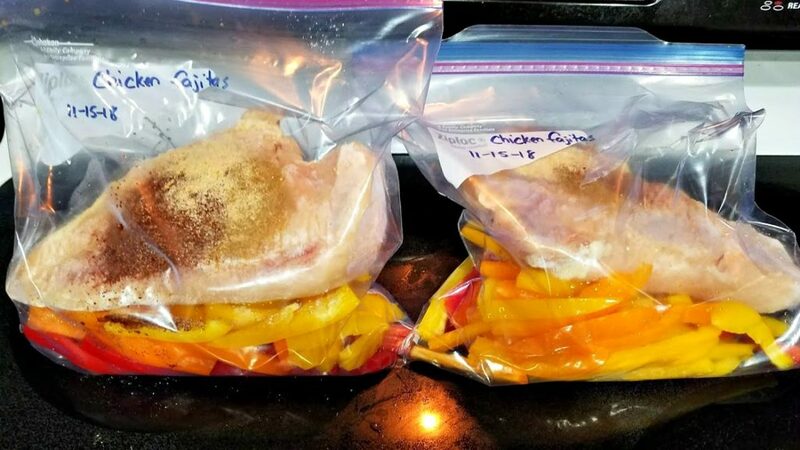 So I started by putting a pound of chicken breasts into each bag. Then I sprinkled taco seasoning over top. 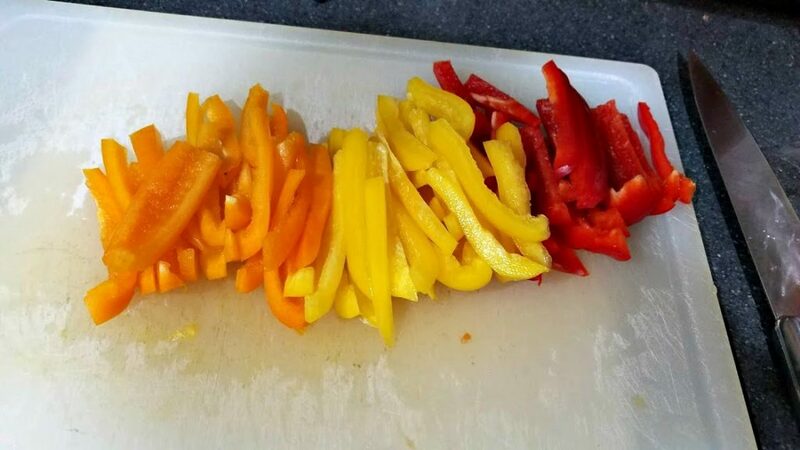 Then I sliced six bell peppers. That’s probably the most time consuming, but once you get used to it you get a lot faster. I slice the tops off first, pull out the middle with the seeds, then cut them in half from top to bottom. I also just realized while typing this that I forgot to add the onions. Oops. Yes, sliced onions go in this, too! They just wouldn’t be fajitas otherwise. Once I finished the peppers, I divided them evenly into each bag. And that’s it! Just put them directly into the freezer and when it’s time to cook, dump a bag into your slow cooker and cook on LOW for 5-6 hours. We ended up freezing both bags because we had plenty of leftovers in the fridge to eat. The recipe below is for one bag, so just double it if you want to make more! These Slow Cooker Chicken Fajitas are an easy Mexican dinner you can dump straight into your slow cooker! 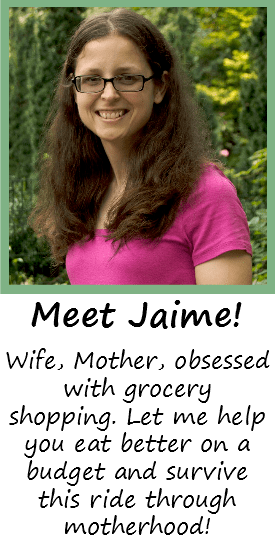 They're freezer friendly, too! Thinly slice each bell pepper and onion. Add to a slow cooker along with the frozen chicken breast. Sprinkle taco seasoning on top. Cook on LOW for 5-6 hours until the chicken is fully cooked. Slice the chicken or cut into cubes and serve in tortillas with cheese, sour cream, salsa, or other favorite toppings. 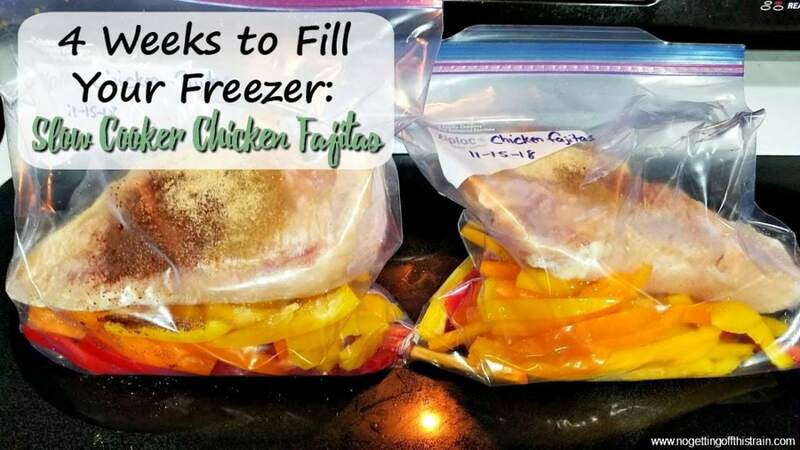 To freeze, add all ingredients into a labeled gallon-sized freezer bag and place in the freezer. Double the recipe if desired. To cook, just empty the frozen contents into your slow cooker and cook on LOW for 5-6 hours.